Soon after entering Missouri we noticed more farms with horses. As we have ridden through the Ozarks it is clear that horses are very important in this rural area. There are local saddle clubs associated with every moderate size town (500-1000 people). 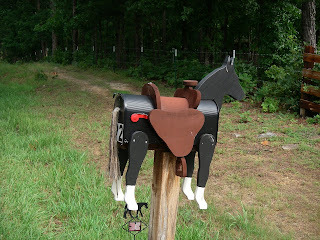 There are horse shows every weekend, there are horse trails in the state parks, and we have seen a variety of horse themed mailboxes. 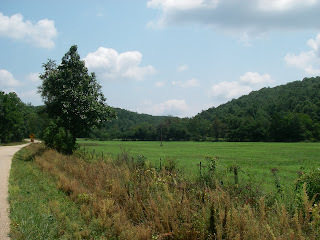 The meadows are lush with grass since an average of 4 inches of rain falls during each of the summer months. We spent Friday in Eminence and experienced a full blown Missouri thunderstorm while camping on Friday night. The fireflies had just come out and then the rain began to fall lightly. We secured everything under cover and got in the tent and about 1/2 hour later the wind and heavy rain began. Lightning was constantly flashing in the clouds for hours and later on two enormous thunderbolts hit the quarry above the campground and sounded like bombs. It rained over 1.5 inches and there was a heavy ground fog on Saturday morning. We waited until the fog lifted and headed out east on Hwy 106. The hills and humidity were extremely challenging as we crawled out of the river valleys in the Ozarks National Scenic Riverways Park. We finished the day in Centerville with a nice campsite on the lawn in front of the courthouse. We continued east on Sunday on Hwy 21 and found this sign quite amusing at one of our intersections. What way ARE we going, Honey? The naming of roads in Missouri is unusual. The counties all use letters for the local roads and can change the letter for a road at any point and seem to do so at the county borders. 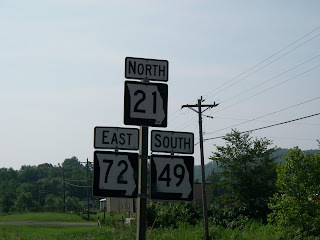 We turned off of Hwy 21 onto N which turned into W and then turned back into N just before Hwy 32. However, we got back onto W as we entered Farmington. Today, Monday, we have been researching the road ahead into Illinois and will cross the Mississippi River tomorrow. And I thought the street signs in Europe were confusing in that the name of the "via" or "boulevard" can (and often does) change several times along its length and the traveler is simply expected to know this. The road sign you photographed is hilarious. That thunderstorm sounded like a humdinger. Hope you had strong tent stakes. Hi Diana, that storm was a humdinger alright. Belinda is referring to that night as the night the big bad wolf huffed and puffed. But he didn't blow our house down... we were very pleased with our tent which withstood the howling wind and pelting rain keeping us dry all night.